The Virginian had a fine college career and a promising start in the minors. In the big leagues, however, he finished with a 6-19 record over one full season plus parts of four others. The record wasn’t a good indication of his talent. 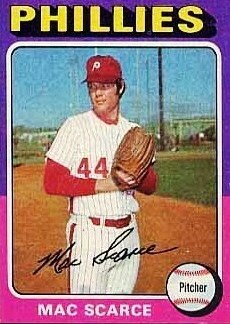 The dreadful 1972 Phillies rushed him before he was ready and he never pitched for a winning team. Then, after 1974 Scarce had hurt his arm. After the boys had finished first grade, their father was transferred to Richmond, Virginia. Mac played baseball from childhood on. “Little League, Pony, Colt, American Legion -- I played ’em all.” He attended J.R. Tucker High School in Richmond, where he was an excellent all-around athlete. He lettered two years apiece in basketball, football (as the quarterback), and baseball (named to the All-District and All-Metro teams). The Manatee Lancers finished second in the National Junior College World Series in 1968. It was quite a team -- four other men would play in the majors: outfielders Dave Moates and Johnny Grubb, third baseman Ron Cash, and pitcher Pat Osburn. Catcher Harry Saferight was called up by the Pirates in 1979 -- but never got into a game. Grubb and Saferight were high school rivals of Mac’s from Meadowbrook High in Richmond. Jack Stallings had a pipeline into Manatee. He had brought his B team down the previous year -- thanks to Lancers coach Bob Wynn, who had played for the Seminoles in the early ’50s and coached their freshman team several years later. Dave Moates, who was a year ahead, had jumped from FSU to the pros, but joining Mac again were Grubb, Osburn, Cash, and Saferight. Mike Scarce, who had previously sat out a year, would later follow the same route. Mike also pitched, but he was a righty. “Landing that bunch of boys transformed us into a winner,” said Stallings in 1970. The Seminoles were 49-9 that year, led by two aces with sub-1.00 ERAs, Gene Ammann and Osburn. Mac saved 12 games, posting a 1-2, 1.62 record with 49 strikeouts in 33 1/3 innings. After final exams, then came the College World Series in Omaha, Nebraska. Florida State beat Arizona, Dartmouth, and Ohio University (starring Mike Schmidt, Mac’s future roommate with the Phillies). Then they beat Texas, avenging a loss two days before to the Longhorns and Burt Hooton. They reached the final against USC. The Trojans, a perennial college power under Coach Rod Dedeaux, featured three future big-leaguers: Dave Kingman, Jim Barr, and Brent Strom. It was an exceedingly tense game that went deep into extra innings. Mac, “who had done a brilliant 7 1/3-inning relief stint,” left it tied at 1-1 but took the loss as USC eventually won it in the 15th. Nearly 40 years later, he still remembered the crushing defeat well. Following another summer with Pierre in the Basin League in 1970, co-captain Scarce was a dominant reliever again at FSU in 1971. In 36 innings across 29 games, the lanky lefty struck out 60, walked 15, and allowed just 15 hits and 4 earned runs. He had a 3-0 record and 18 saves -- then an NCAA Division I record -- to go with his 1.00 ERA. The ’Noles were 41-16, but Mississippi State represented the SEC in the College World Series that year. Bunning told his biographer, Frank Dolson, a story about Mac during his first year as a skipper. It was the same message he gave Scarce in person. Philadelphia gave in to temptation after losing two veteran lefty relievers. In mid-June, they traded Joe Hoerner to Atlanta, and a couple of weeks later Chris Short went down with back problems. On July 10 – the same day that Owens fired Lucchesi and took over as field boss -- Scarce made his debut against the Dodgers at Veterans Stadium. He did well for three innings, allowing just one run, but took the loss as Willie Davis and Manny Mota singled to open the 11th and reliever Darrell Brandon could not strand them. Scarce didn’t pitch badly as a rookie (1-2, 3.44 in 31 games). He did walk a lot of batters but also struck out over one per inning. He got his first big-league win versus the Mets at Shea Stadium on August 2, and the more notable of his two saves came against Cincinnati’s Big Red Machine on August 26. With the score 4-3 in the ninth inning, runners on second and third, and nobody out, Mac retired Pete Rose, Joe Morgan, and Bobby Tolan. Steve Carlton got his 21st win. “There were two Steve Carltons in his career,” Scarce says. “I knew the first one. Carlton helped me, he offered a lot of tips. After I left, that’s when he became a physical fitness freak and didn’t talk to the press any more because they labeled him unfairly. “We were the best team in baseball when Carlton pitched that year. We were the worst team when he didn’t. We had a lot of guys just putting in their time.” On a lighter note, Mac remembers how the team “laid down the red carpet of towels” for pitcher Ken Reynolds on September 1, when he finally got his first win after an 0-13 start. In 1974, Scarce appeared 58 times, with marks of 3-8, 4.99. That June, Phillies pitching coach Ray Rippelmeyer reportedly advised Mac to relax, saying “You’re too tense on the mound. You’re trying to make every pitch perfect and overextending yourself. . .Throw naturally.” In the middle of August, the Phillies sent him to Triple-A Toledo. Though he returned after eight games there, he remained hittable. On December 3, 1974, the Phillies made a trade with the New York Mets that would help them become a playoff team and eventually a World Series champ. They sent young catcher John Stearns, outfielder Del Unser, and Scarce to New York for Tug McGraw, Don Hahn, and Dave Schneck. Schneck never played again in the majors, and Hahn entered just nine games for Philly before finishing his big-league career in St. Louis and San Diego. Stearns and Unser would serve the Mets well, but fireman McGraw was vital. The Mets had hopes that Scarce would be a key bullpen man in 1975, but he faced exactly one batter for them. On April 11 in Pittsburgh, the Mets were up 3-0 going into the bottom of the 9th inning. Then Jerry Koosman weakened, allowing three straight singles. Though reliever Rick Baldwin got one out, it came in between a walk and a single that tied the game. Scarce then gave up a game-ending single to Richie Hebner. Four days later, he was traded to Cincinnati for Tom “The Blade” Hall. “The Reds said, ‘OK, see if you can work out a deal.’ But the trading deadline passed, and I said, ‘Y’all win. Where do you want me to go?” That turned out to be Single-A Tampa for 11 games, followed by a return to Indianapolis. Scarce worked for an electrical company for a few years and then went into the mortgage business. He became a broker in Alpharetta, Georgia, with his own company: McCurdy Mortgage, formed in 1990. Amid the turmoil in housing and financial markets of 2008-09, he said that business was good because a lot of people were refinancing, or wanted to. Mac married his second wife, Kathryn Smith Scarce -- “my soulmate, the love of my life” -- on November 17, 1992. Although he and Kathy did not have any children, his daughter from his first marriage, Amanda, has given him two grandchildren. Kathy Scarce was diagnosed with breast cancer in May 2012. She passed away on December 30, 2014, aged just 63. Her loss left "forever emptiness in my heart," Scarce said. The Florida State Athletics Hall of Fame inducted Mac Scarce in 1985. J.R. Tucker High School did likewise in 1998, and State College of Florida (which started its Hall only in 2006) followed suit in 2012. Grateful acknowledgment to Mac Scarce for his personal memories (telephone interviews on April 16 and April 21, 2009) and e-mail (June 4, 2018). Updated again on July 2, 2018. Tyler, Lyon Gardiner (editor). Encyclopedia of Virginia Biography. New York, NY: Lewis Historical Publishing Company, 1915. Lossie Guerrant Scarce obituary, Danville Register and Bee, February 10, 2007: 4. DeLuca, Duke. “Runs Scarce Against Scarce”. The Sporting News, June 17, 1972: 41. “Wynn’s Impact Felt by Many”. Bradenton Herald, August 10, 2000: 2 (sports). “‘Pro’ FSU Shoots for Top”. St. Petersburg Times, May 28, 1970: 2-C.
 “One Test After Another for Seminoles”. St. Petersburg Times, June 6, 1970: 4-C.
 Madden, W.C. and Patrick J. Stewart. The College World Series. Jefferson, North Carolina: McFarland Press, 2004: 99-101. “U.S.C. Nine Takes N.C.A.A. Final, 2-1; Beats Florida State in 15th on Alfano’s Bases-Full Hit”. New York Times, June 19, 1970: 62. Despite his reputation as a one-dimensional slugger, Kingman would still bunt for base hits as a big-leaguer, at least in his early years. In fact, on June 18, 1975, the slugger dropped down bunt singles in his first two at-bats at Jarry Park. Chamberlain, Charles. “Trojans Claim Fifth NCAA Title”. Associated Press, June 19, 1970. Lewis, Allen. “Phil Rookie Scarce Long on Hill Talent”. The Sporting News, December 11, 1971: 51. Dolson, Frank. Jim Bunning: Baseball and Beyond. Philadelphia, PA: Temple University Press, 1998: 140. Giordano, Paul. “Guerrant McCurdy Scarce: A Phillies’ Bright Spot”. Delaware County (Pa.) Times, March 12, 1973: 15. Bender, Bob. “Despite Scarce Heroics, Phils fall to Pirates”. St. Petersburg Times, April 3, 1973: 2-C.
 Kelly, Ray. “Quakers Miffed by Scarcity of Mac’s Headlines”. The Sporting News, June 8, 1974: 3-4.